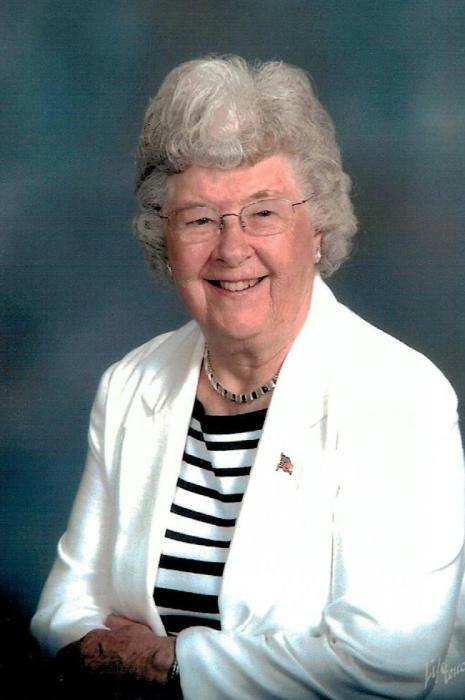 Obituary for Madeline Eckert Martin | Fletcher Funeral & Cremation Services, P.A. Madeline E. Martin, 97, of Westminster, died Thursday, February 7, 2019, at the Brethren Home Community in New Oxford, PA. Born on October 2, 1921, in Silver Run, she was the daughter of the late W. Wallace Eckert and Grace Haines Eckert. She was preceded in death by her husband of 58 years, Russell D. Martin who died on October 14, 2000. Madeline graduated from Westminster High School. Before retiring she was a Secretary at Union National Bank. She was a member of Order of the Eastern Star Chapter #94, the Ladies Auxiliary at Carroll Hospital where she volunteered at the gift shop and also at the Brethren Home at Cross Keys. She is survived by 4 children Robert A. Martin and wife Janet of New Oxford, PA., Joseph B. Martin of Richmond, VA., Patrick A. Martin and Christine Ferraro of Westminster, and Amy S. Martin and husband Scott of Hampstead; daughters-in-law Arlene Topaz Martin and Gail Shaffer Martin. She is also survived by 9 grandchildren Scott R. Martin, Michele E. Smith (Donnie), David A. Martin (Allison), Jason A. Martin (Amy), Russell G. Martin (Kathy), R. Daniel Martin (Jennifer), Andrew S. Martin, Noah E. Martin and Julia T. Martin (Ben Plache), 17 great-grandchildren, and extended family Paul and Mary Offutt of Missouri, and David and Penny Warner of Manchester. She was predeceased by her siblings Leroy Eckert, Virginia Eckert Forsythe, Vera Eckert Hoch, and a granddaughter Lauren A. Martin. The family will receive friends on Friday, June 7, 2019 from 6 to 8 p.m. at Fletcher Funeral & Cremation Services, 254 E. Main St., Westminster. Private inurnment at Westminster Cemetery. In lieu of flowers memorial contributions can be made to the Brethren Home Community, 2990 Carlisle Pike, New Oxford, PA. 17350 or VNA Hospice at VNA of Hanover and Spring Grove, Attention: Development, 440 N. Main Street, Hanover, PA. 17331. There's still time to send flowers to the Visitation at the Fletcher Funeral & Cremation Services, P.A. from 6:00 PM to 8:00 PM on June 7, 2019.